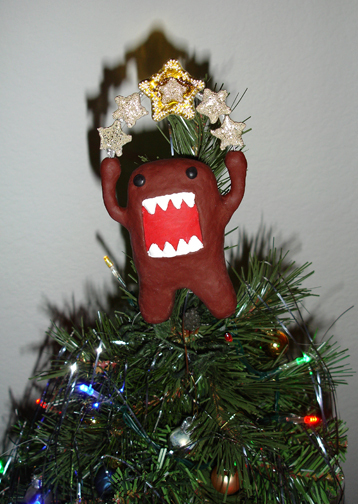 This year I finally sculpted the Domo star for my little Christmas tree. I have had the basic idea in my head for a couple of years now, believe it or not. He’s sculpted out of polymer clay. The stars were made out of the UV Resin I am really loving right now. I added accents on the stars by applying tiny silver beads into the resin before it was cured. Yellow alcohol based pigment was used on the big star in the middle, then the tiny silver beads were shaped into an inner star shape on top. 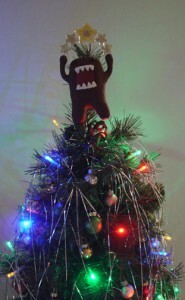 Here’s another shot of Domo on the tree, taken with the flash so he’s easier to see. He’s attached to the tree with floral wire that I wrapped with green floral tape so it would blend in with the tree. The wire was coiled into a tight spiral so that it could be wrapped around the tree and the end is inserted in a small hole I made in Domo’s right foot. 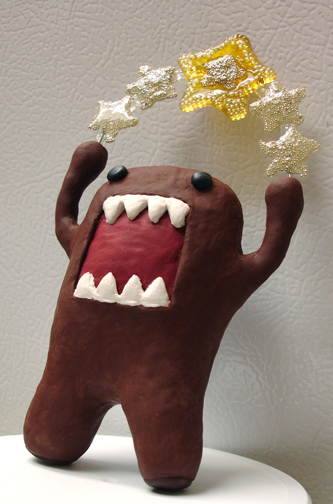 5 Responses to Ho Ho Domo! Haha! Thanks! Domo is the best! Great design! Fantastic detail! More! We want more!! !